This time around, Mr. Knitting and I are making Na Craga, from Alice Starmore’s Aran Knitting. That’s what that brown mystery swatch was for. It’s the most specific swatch I’ve ever knit. Cast on number was specified, as were number of pattern repeats. I got gauge in the first go. Imagine! Buttons were purchased at SPA. I am ready ready ready to knit this project, however, this might be the last anyone sees of it for awhile, as I’m doing some supercool design work and after that, there’s Yarn School, and after that, hopefully fruitful house hunting. Oh! There’s a new yarn that’s captured my heart. You wouldn’t have been able to resist it either, would you? It’s from Webs. My friends and I might have cleaned them out of this color (#4). The fiber content is 40% cotton, 30% silk, and 15% each wool and nylon. It’s a cottony, papery version of Kureyon, except the skeins are 100g! I used to moan about the discontinuation of Cotton Kureyon to anyone who’d listen. No more! I’ve found my new best friend. With this, I think I need to knit a boatneck summer sweater, maybe with 3/4 sleeves. The yarn is lovely enough to just go for the horizontal stripes, despite being of fluffy build, but I might experiment with a neck steek and knit it side to side. I’m off to dye mitten kit yarn. That’s really all you wanted to hear, right? That is going to be one warm sweater! 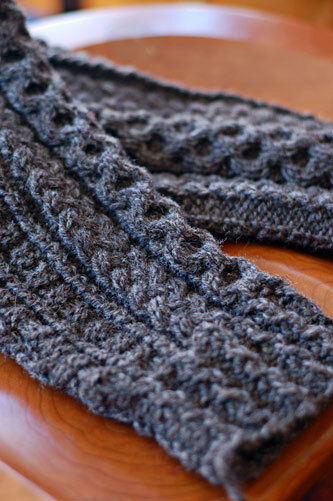 The yarn shows the cables really well….. This is one of my favourite knits, having done it on three separate occasions. What a great idea to slim up the sleeves, and bring it in closer to the body. It was awesome to finally meet you! And that cupcake–I’m usually not one for sweets but that thing was unreal!! Sublime! Those cables are just gorgeous, and I love the buttons. It’s going to look great when it’s finished. That’s beautiful yarn – both of them. I have quite a few 8 oz. hanks of handspun sitting around, thanks to the jumbo plyer on my Rose! Great for avoiding joins, not so portable. Can’t wait to see your sweater(s)! I was just starting to suspect you two had a little knitalong going on. ahh! I love na craga! your sleeves look awesome (and I’m another lover of the scratchy wools, so HOORAY!). You need to turn the giant yarn cake on its side! So we can see the rings of it’s tree trunk stature. Maybe then its true size will be visible. Of course all we want to know about are the mitten kits. I check every day. Waiting and waiting. there is definitely something 80es about alice’s designs. and maybe that will be the next thing to be stylish. enormous sleeves that you cannot get in to your coat sleeves. tha yarn is great and i am sure you will finish it real soon. cables are so rewarding because you keep pushing yourself over the edge. nothing like garter garter garter…. Pretty Noro! I can’t wait to find some and touch it! i love that noro. the color is just fabulous. and yay for mitten yarn. that’s totally what i was waiting to hear. Dude, I was at my lys, and there was a giant ball of bulky yarn– like, one of those big hanks of cascade something or other? I sort of imagine it’s a pound of yarn. I stood there, holding it in my (large) hands, and exclaimed, “I feel like a fairy!” Good times. The sweater looks to be gorgeous. But that yarn (Noro) is to die for!!!! I have a bunch of Cotton Kureyon buried in my stash. 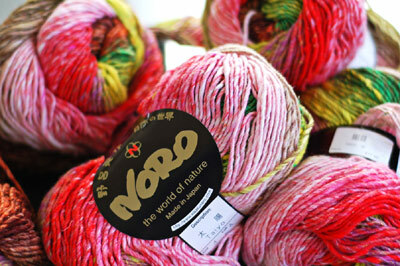 I didn’t think anyone even remembered that Noro made such a yarn. … love love love the Noro! I had. no. idea. Na Craga is such a great pattern. I made one for my rather large brother-in-law so no mods were required for him. I can’t wait to see how you change it to suit you. I might have to consider knitting one for myself. Great antler buttons! I had some as a gift from my inlaws once — I put them on a natural colored (Shetland 2000) fair isle cardigan — they’re terrific. I *love* the way those sleeves look, scratchiness and all! 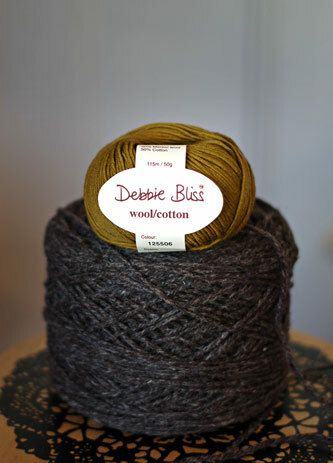 And I love the depth of the wool color. Now THAT’S the kind of skein or ball you want for sweater knitting! I love it. I’ll have to try and find the Na Craga pattern. Dammit. I didn’t even know Taiyo existed and now I have to have it! Wow! Your Na Craga sleeves are spectacular! Got huge balls of Na Craga in Ireland? It wasn’t marked as Super-chunky was it? In this case however, the cigarettes were the same length – but thicker! Bigger around, but not longer.